Growing up, I have had a hard childhood. There were many things that I needed that were not given to me, which led me down a different path in life. One major reason I feel that got in the way of me graduating would be my family problems. I would always argue with my uncles and sometimes my mother. My stepfather never liked me either. One day he kicked me out of the house and I was only nine. He used to hit me and no one would stop him. I was sent to a foster home until he was removed from the house. I grew very distant from my family and closer to my friends. I ran away to the only people I felt loved me. I was happier, but I had no food to feed myself so I got a job that paid me under the table. I thought it was better than going to school because I was making money. I later started realizing as the years went by, that my friends that were my age were making three times more money than I was, so I wanted to go back to school. 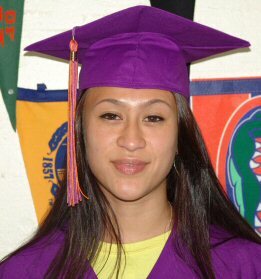 EOYDC has helped me so much because I need my GED to pursue my dream of becoming a registered nurse. Ms. Anana was such an encouraging person that made me feel like I can accomplish anything. After completing this GED program, I am so glad that I can prove all the people wrong that thought and said to me that I would never amount to anything. Thank you, Ms.Anana and EOYDC!